Two wolf people are howling at the moon in the Alaskan forest when the female of the pair is shot by a hunter. A green jeep flees the scene as the werewolf screams in despair over his fallen mate. Later, our heroes are driving through the woods in a green jeep similar to the one the hunter who shot the fox woman was driving. 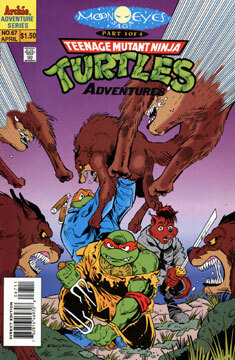 Ninjara and Raphael continue to fight, Ninjara is upset over Raph’s cynicism. Another vehicle approaches and inside is an old man and a boy, who stop to see if everything is alright as services in the area are few and far between. April assures the man that all is fine, they had only pulled over to study the map, and the fellow drives off. The reporter and her friends decide to camp in the spot for the night and build a fire and pitch tents. Don explains how the Aurora Borealis works and Ninjara dejectedly gets up to take a walk. Raph follows and asks her what the problem is and she explains that she feels adrift in her life with the TMNT, that she’s not following her own path but that of the Turtles. Raph states that he thought she liked being with them, and Ninjara points out that Raph doesn’t know what she thinks because he never asks her. Suddenly, Ninjara hears howling in the distance and runs off to investigate, leaving Raph behind. Leo joins his bemused brother and the two set off in pursuit of the unhappy fox. The teens find Ninjara frozen on all fours, staring into the woods. Raph asks her what she’s doing and she angrily points out the countless pairs of eyes peering at them from behind the curtain of foliage. The trio is suddenly surrounded by a pack of wolves. Leo suggests that they calmly vacate the area, but Ninjara refuses to leave. One wolf approaches her and stares into her eyes, and she states that it’s trying to tell her something, or someone, is coming. Just then, April, Mike and Don crash through the brush with weapons drawn. Ninjara observes that she didn’t expect the arrival to be her compartriots, when another being arrives – the wolf man from the beginning of the issue, who introduces himself as Mokoshan and tells our heroes he’s going to kill them for trespassing! Additonal Material: 6 page Inky (Tattoo’s pet dog) story by Gunther Jones, Eric Talbot and Jim Lawson.